Portland, Oregonian four-piece Holy Grove have been one of their home city’s most eagerly anticipated bands for the last couple years, managing to stand themselves out from a crowded scene even before they really got around to putting out music. To wit, their self-titled debut arrives with stunning cover artwork by Adam Burke through Heavy Psych Sounds preceded only by a two-song live recording, Live at Jooniors (review here), with the songs “Nix” and “Holy Grove” (both of which feature on the album) and rolls out massive, Billy Anderson-tracked grooves that seem a long time coming from the group, who are veterans of Hoverfest and soon-to-be Psycho Las Vegas, when in fact they’re not in the slightest. 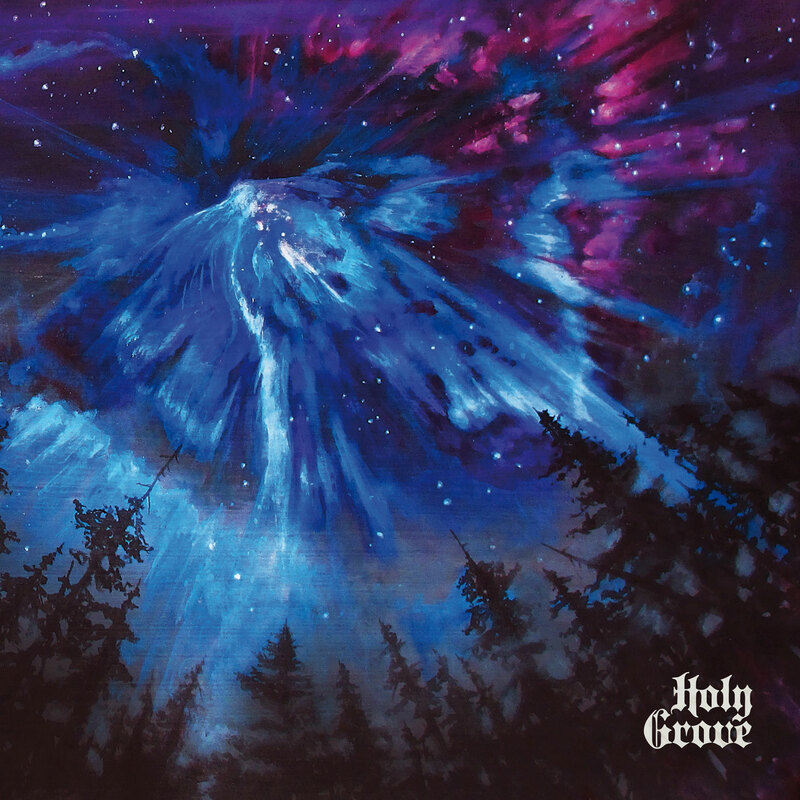 Holy Grove formed in 2012. There are debut albums that have been much longer in the making. Nonetheless, the seven tracks/43 minutes of Holy Grove‘s Holy Grove establish a veteran-style presence throughout their run, thanks in no small part to patient tempos, a general awareness of where they want to be sonically, graceful, thick tones, and the masterful vocals of Andrea Vidal, who is an oft-layered force atop the familiar “Nix” and preceding opener “Death of Magic,” furthering a classic heavy rock vibe even as the band takes a modern-sounding approach — I’ve also never known an Anderson record to have a particularly retro aesthetic, natural though they may be — in consuming tonality and unmitigated groove. Guitarist Trent Jacobs, bassist Gregg Emley and drummer Craig Bradford (first replaced by Ryan Northrop, also of the recently-put-on-hiatus Sons of Huns, then by current drummer Adam Jelsing) craft a flow within and between the songs, which either stop for effect or bleed one into the next across a vinyl-minded construction that ultimately asks little more of the listener than a nod along — and even that Holy Grove make easy. 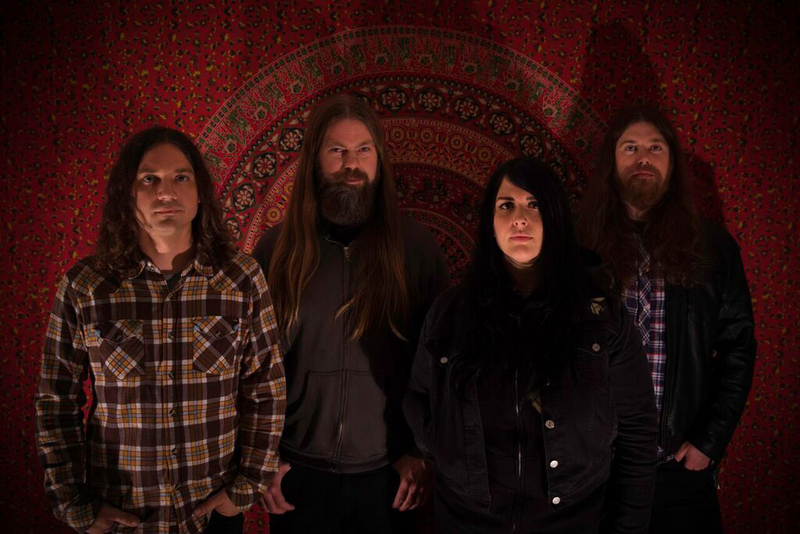 Kicking full force into the second half of the album, “Caravan” offers a genuine boogie from Holy Grove, which is territory they’ve come close to but never quite danced all over like they do within, and it works both in the context of mirroring the catchy open they gave Holy Grove with “Death of Magic” and the grander ending to come with the last two tracks, the arrival of which is announced by far back and fading in vocals on “Hanged Man,” the longest cut on the record at 8:49 and arguably the most ambitious as well. It finds its crux somewhere between the unfurling Candlemassian doom of its opening movements and the NWOBHM-meets-Kyuss (think meaner-toned “Green Machine”) gallop that arises past the midpoint, but the really telling factor in all of it is how well Holy Grove command the proceedings throughout, marrying varied styles and ultimately coming out of it with something all the more their own. “Safe Return” (the second longest track at 7:28) rounds out and answers the Electric Wizardry of the intro to “Huntress” in its own, but also sets its own course. Perhaps more in line with “Nix” or “Holy Grove,” “Safe Return” does indeed feel a bit safe after “Hanged Man,” but its purpose is manifold as the closer in that not only does it tie together the various elements at play across the record, but it expands on how “Huntress” finished side A with its own upbeat turn around a vicious hook delivered by Vidal before it drops out and launches the last build, crashing to a stop that feels all the more sudden considering how fluid the band’s transitions between songs have been all along. It is a debut, so I won’t say Holy Grove feels like the sum total of what Holy Grove have to offer, either in songwriting or execution, but the band does affirm and restate their potential throughout while providing a foundation from which to continue to build, and for the quality they bring and the sense of work done on these tracks, their self-titled will no doubt earn a place among 2016’s more resonant debuts. This entry was posted	on Monday, March 14th, 2016 at 10:02 am	and is filed under audiObelisk, Reviews. You can follow any responses to this entry through the RSS 2.0 feed. You can leave a response, or trackback from your own site. Hello, it should be noted that drums on this record were performed by me, Craig Bradford, founding member and original drummer for Holy Grove. Updated the post. Thank you for letting me know.